Most people out there will have heard of William Hill, due to the fact they’ve been a sports betting institution for a number of years. But did you know that they’re not just betting shops anymore, there’s a whole raft of games available online and we at Mobile Bingo Bonuses are her to tell you all about it. William Hill Casino is a sleek and innovative site offering a huge range of games including Table Games, Roulette, Blackjack, Card Games and Slots such as Gladiator and Avengers. What adds to their appeal is the fact that you can access most of the games on your mobile devices. All you need is a smart phone such as an Android, iPhone or Tablet then you can game when and wherever you like. This makes those mundane chores such as walking the dog much more exciting and hopefully rewarding if you win a jackpot or two! Welcome bonuses on William Hill vary depending on what platform you use and how much you deposit. Download Deposit – If you make your 1st deposit via the William Hill Casino download client then you’re eligible for the welcome bonus. For high rollers if you deposit £1,000 you’ll receive an additional £500 and for any 1st time deposits up to £200 you’ll receive a 150% cash match bonus. 1st Deposit – If you don’t have an account with William Hill Casino then for your 1st deposit you’ll receive a 100% cash match bonus up to £150. For high rollers who deposit £1,000, you’ll receive £300 in credit. On your 2nd deposit you can continue in the excitement because you’ll receive a 75% cash match bonus on a minimum £10 and up to a whopping £100. If you’re a social media follower then check out William Hill Casinos Facebook and Twitter pages for the latest games and promotions. William Hill Casino provide customer support on a 24/7 basis online and via telephone. William Hill Casino offers all its players the opportunity to join an exclusive loyalty program, that rewards you with all the benefits and bonuses through their comps currency. Earning points is as simple as playing and they can be redeemed as additional gaming credit. It would be mean not to tell your mates about this great site so why not earn a little bonus for it. For each friend you refer who makes their 1st deposit, you’ll receive £50 bonus credit and your friend will receive £50 too! For the regular players you may be invited to join the exclusive William Hill Casino VIP Club with benefits ranging from special promotions to bonus offers. They accept the usual banking methods including Credit and Debit Cards, Paypal, Neteller, U Kash, Paysafe Card and Skrill. 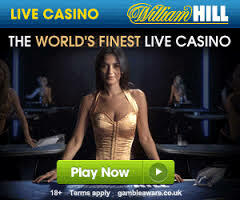 Why not register and take advantage of the William Hill Casino impressive welcome bonuses.